Spring has begun sprunging here in the Northeast, so I’m back to flipflops for the duration. Which means I need more than basic red on my toes. It’s been awhile since I did a fun design, so hey, there it is. It’s really subtle, which I’m not sure if I’m pleased with or not. But I’m not changing it now! And in other, non-makey news, I have a big hole in my mouth (no, you don’t get a picture of it). This one tooth has been a problem for YEARS. I’ve gone from fillings to root canal to post & core with crown…and the other day the crown popped off and I swallowed it. Ulp. To make matters worse, my beloved dentist (who did all the recent work on the tooth) hurt his back a few months ago and hasn’t returned to dentistry. So I went to his associate, who tells me the reason the crown fell out is because the tooth broke, and now there’s not enough tooth to mount a crown on. My options are: gaping hole, bridge, implant. Oh, and by the way, the remainder of the tooth needs to come out and it’ll have to be a surgical extraction because the root has fused to the jawbone. GOOD TIMES. Good, very expensive times. Now, my aforementioned beloved dentist would totally cut me a deal on the implant (or bridge, but I’ll probably eventually go implant b/c it’s lower maintenance and only a couple hundred bucks difference which at that point isn’t worth quibbling over), because he’s awesome like that and even though it’s not his fault he always took responsibility for when his dentistry didn’t stand the test of time (seriously, though, it’s not him — it’s this tooth). But the new guy has no reason to do that, which I totally understand — it’s just irksome because I’d be going to my guy if he was available. On the plus side, though, it’s not at all painful, so it could definitely be worse. I mean, it’s going to be painful when I have the extraction, so I have that to looks forward to, but at least it’s not an emergency type situation. Small favors and all that. No post for yesterday. I swallowed a crown and, well, dealing with that took up most of my free time. 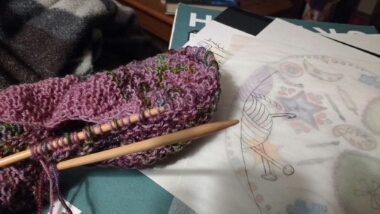 Today I just did a couple of rows on my shawl and a rough re-work of part of the tattoo I’m getting started Saturday. You can see a bit of the full rough under the tracing paper — the tat is going to be quite a bit different from my sketch, but I’d planned for that going in so that’s fine. I met with the artist last week, and I’m really excited to see how he reworks my ideas. We’re doing the line work Saturday, then we’ll fill in the color in a few weeks (I have to make sure I schedule for when I’m going to have a couple weeks off derby — don’t want to risk falling on it fresh!). 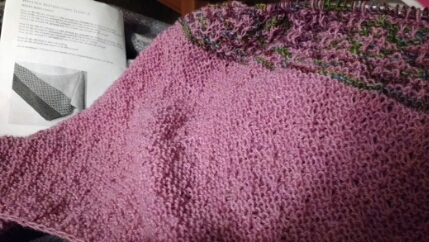 On the shawl, I screwed up the last two rows I did. It’s in the mosaic section, which really doesn’t read strongly with the yarns I chose, so I’m not sure it’s worth it to rip back. OTOH, if it does end up being more obvious, like maybe in the light where the solid is more gray than pink, it will always annoy the hell out of me. Sigh. Time to do some un-making. But I did get some knitting done. This is Emiliana by maliha designs. I’ve been working on it for awhile now, and I’m about halfway through. The slip stitch pattern is really simple but fun. Unfortunately, I think a lot of the mosaic pattern is getting lost because of the variegated yarn I’m using but we’ll see how it turns out. The best part is, I’m using two yarns from my stash! The variegated is Socks that Rock mediumweight in Tanzanite, and the “pink” is actually a color changing yarn that looks grey in some light. I got it at Rhinebeck a few years ago, and of course I can’t manage to put my hands on the label right now. Will update when I find it. Originally published on Tasteful Diversions May 2012. To give my hands and arms a rest from the massive amounts of knitting I’ve been doing lately, I decided a little crochet was in order. Something quick and easy and fun and Spring-y was just what I needed. When I came across Veronica O’Neil’s Bird of Prey I knew I’d found my project. Obviously for Spring I didn’t want to do it in plain black (though I am definitely going to in the future — I could use a plain black shawl and this one is so easy!) and I happened to have some Hometown USA in Dallas Grey handy. I really didn’t want just plain grey, though, so I thought I’d add some colorful fringe. One ball of Monterey Lime later, there were some pretty green accents around my shawl, and it was starting to feel downright vernal. It still wasn’t quite enough, though…those long green fringes seemed to evoke stems, so I hunted up an easy flower pattern and grabbed some random bright bits and bobs and set to. I ended up alternating green and grey fringe — all green was just way too much — and the flowers are 8 different colors. I had originally thought to put some flowers in the middle of the shawl as well, but decided I was done making flowers like it just fine like this. A couple of notes on the flowers: I found it much easier to end up in the right spot if I joined the petal color somewhere other than the beginning/end of the flower center, and I only did a single petal on each flower rather than the double given in the pattern (I just didn’t do the second repeat). If this doesn’t say Spring, I don’t know what does. The flowers actually took two or three times longer than the shawl, which only took me about 3 hours. 3. Hours. I know, right?!?! Because I am super slow and this was superfast. Now you see why I’m going to make one in black, too. Heck, I might make one in every single color of Hometown USA.